Super Hero Boy: I think Beethoven would be proud! I think Beethoven would be proud! I think most parents at this point have bought or at least thought about buying at least one classical music CD for their babies or for bedtime. Well what about for toddlers or for dancing?! I'll admit though we LOVE classical music and I have it on Connor's play list for bedtime, nap time, and quiet time I never even considered it for play time. Beethoven's Wig reinvents classical music in a way thats funny, entertaining, and worth of some serious dancing, its pure magic. 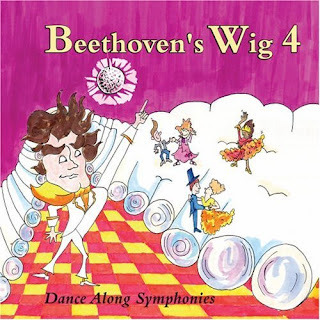 Beethoven's Wig's new album Beethoven's Wig 4 Dance Along Symphonies is now exception. Please Mr Ringmaster set to the Circus March almost made me split a seam laughing, the lyrics set to the classics that you would immediately recognize even if you do not know the names are surprising as they come out of the band's pure imagination. I am honestly glad I didn't hear Beep Beep Beep a few weeks ago as I would have had a hard time keeping myself from singing Beep.. Beep.. Beep during my classical music class in college I finished last semester. I actually had to restrain myself from doing it the other day when Connor was napping happily to Moonlight Sonata while we were in the car. I did end up letting loose a giggle which almost woke him but it was worth it. Beethoven's Wig 4 Dance Along Symphonies is brilliant and worth a look for those who love classical music and those that are just looking for some new great (and funny) dancing music. Connor certainly approves. You can pick up your copy on Amazon!